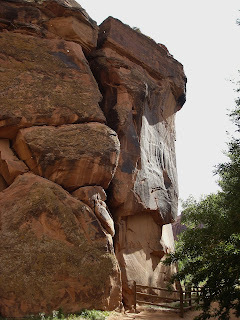 The Southwest Through Wide Brown Eyes: Camping Amongst Moonflower Canyon's Ancient Petroglyphs. Camping Amongst Moonflower Canyon's Ancient Petroglyphs. 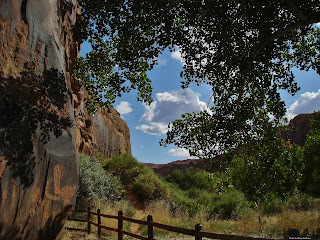 In yesterday's write up on Kane Creek Blvd., I teased you with a few tidbits about Moonflower Canyon. This small box canyon is found about three miles up the road, and is appropriately named for the extensive growth of Dakura (aka Moonflower, Jimsonweed, Angel's Trumpet) in the area. It is a sacred plant to the Native Americans and was used in ceremonies, mainly for the hallucinogenic properties which were needed for "vision quests". ﻿Now I spoke with one of my Native American friends who told me that it is definitely not used anymore due to its also very toxic properties which can seriously injure brain and bodily functions, or cause death. I'm going to get all the warnings about Dakura done with now, but the gist of it is; don't eat it or you're taking your life into your own hands. Dakura is a part of the nightshade family containing naturally occurring tropane alkaloids. These plants are essentially for landscaping, not culinary, use. If ingested, get to the hospital immediately for treatment; it will take 24 - 36 hours for the plant to get out of the system with, hopefully, no side effects or damage. Consider yourself thoroughly forewarned; now lets get back to Moonflower Canyon itself. 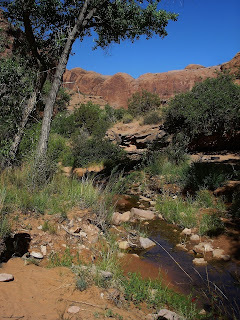 It is a completely beautiful environment with the Colorado River just across the roadway. 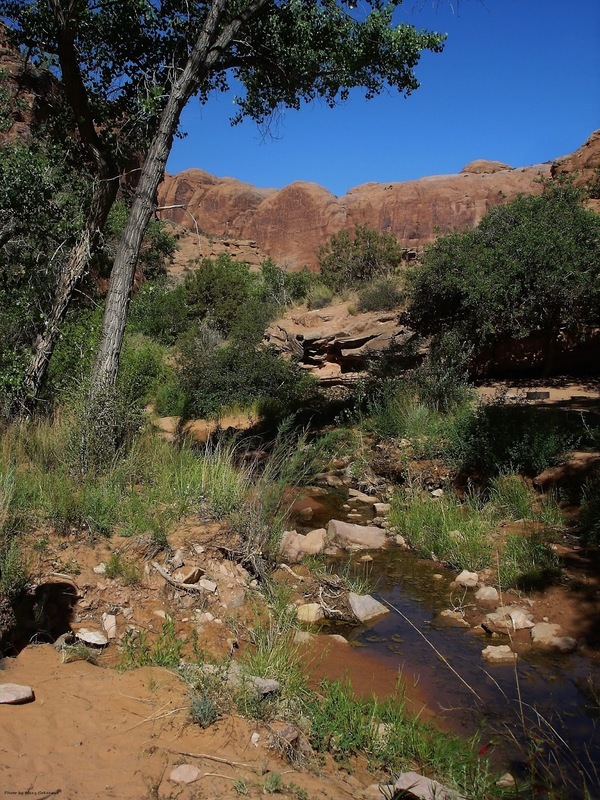 There are eight campsites available and this area is considered a "primitive" area with no water or electricity. Moab is only three miles away if you need civilization, or supplies; there is a toilet facility and garbage bins, so no excuses on why you cannot keep your campsite clean. As you explore, you will find a creek running through towards the far back of the Canyon; during rainfall, a large pothole fills with water, and sometimes a waterfall will form off the back wall. It is a very quiet and peaceful area and your only visitors might be one of the local birds or lizards. 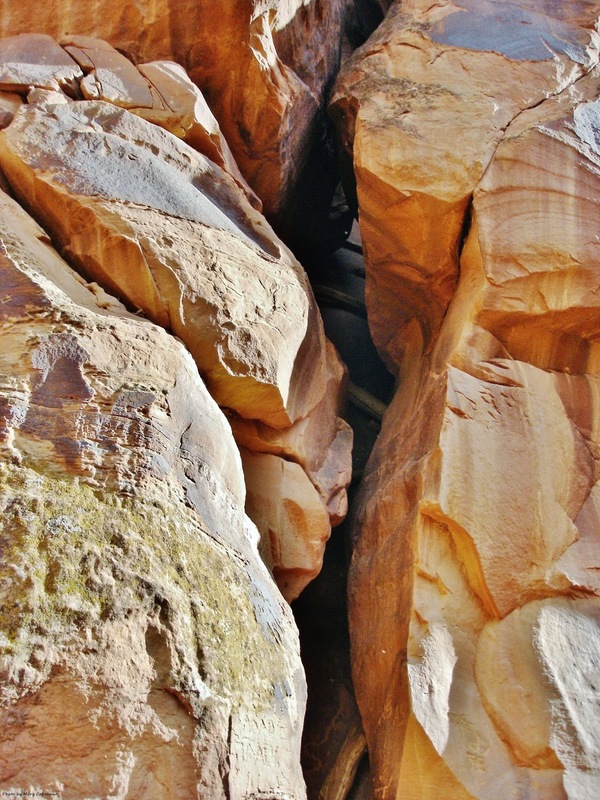 The Canyon is surrounded by sandstone walls and many a cave has developed due to erosion; or perhaps helped to form by ancient hands. I've seen folks camp in or nearby the caves; but like any campsite keep it clean, and most especially do NOT damage the sandstone walls. You were there, but now you're gone; please don't carve your name to carry on. 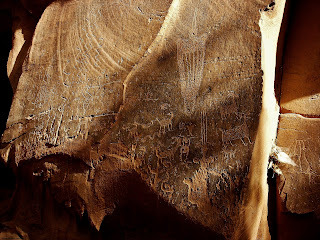 Which brings me to one of the major reasons Moonflower Canyon has become a large tourist attraction, the Petroglyphs. The petroglyphs date back about 2000 years during the Archaic Era to the Preclassic Era; basically when pottery making, loom weaving, stone grinding and drilling were in full swing. 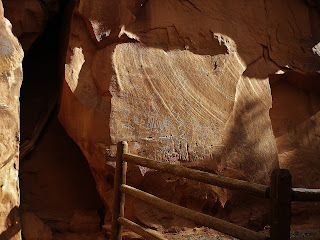 Unfortunately these petroglyphs were seriously vandalized throughout the years, and the fencing around them doesn't keep all the "idiots" out. Next to the "rock art" is a large split in the wall with remains of a wooden ladder inside. It was theorized that the ancient Native Americans used this to climb up higher on the wall to carve their "writings". 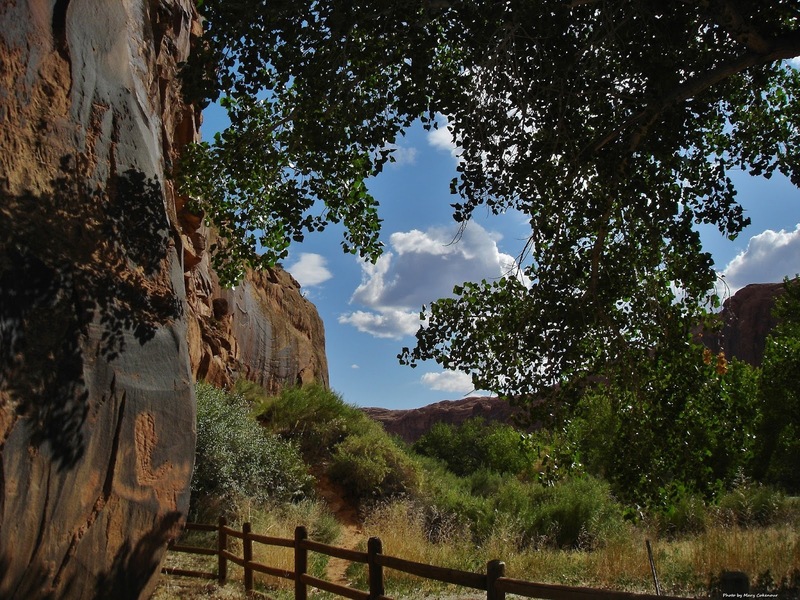 Moonflower Canyon is one of those places that, yes, you can see ancient Native American history; but it is a place that you can camp for the night, or bring a picnic meal and visit for the day. It is one of those places that is tranquil, bringing rest to the body, mind and soul. Enjoy the soothing.